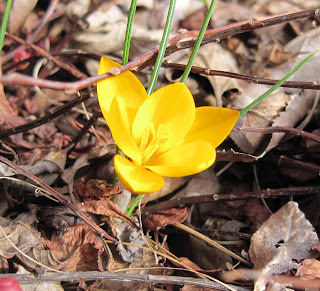 the first crocus of the season. I still need to... (fill in the blank)! In that brief instant of seeing that first crocus, I suddenly realized that winter really is going to end and spring really is coming. Everything I was going to do over the last few months, while the garden was buried in snow, suddenly came to mind. Organize all the seeds to make sure I have all that I “need’! Gather up my seed starting supplies and get going on the tomatoes, peppers, and eggplant! Figure out if and how to replace the raised bed frames in the Vegetable Garden! Meet with the garden designer! Prepare to meet with the garden designer! I should have (fill in the blank)! Cleared out the dining room of all that stuff I stashed in there “awhile ago” to get it out of the way. Cleared out the spare bedroom where I moved some of the stuff that I wanted to donate. Finished my catalog of what grows in my garden. Oh, wouldn’t that be handy to show a garden designer? Cleared some more bookshelf space so that the newer gardening books don’t have to be stacked on the floor in front of the bookshelf. Exercised more so I’d be in better shape for gardening. Then I see more crocuses starting to bloom. And I’m reminded that everyone has a case of the “I still need to’s” and the “I should have’s” around this time of year, as winter leaves and spring finally arrives. The only cure is to keeping looking forward, get out into the garden, and just do what we can and let the rest be. Dr. Hortfreud would approve, don’t you think? Nah, I just think "Thank God, winter is almost over." Especially this winter. How I feel about it depends on the mood I'm in when you ask me! I always have a list of "I need to's", most of which fall by the wayside. Like Dee, I am ready for this long cold winter to be over. I so wish I could grow crocus! They're such charming flowers. Seriously?! 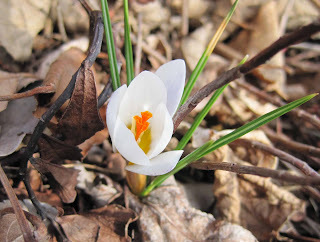 You have crocus already? I'll have to walk around tomorrow and see if any of mine are blooming! I'm so glad it is warming up! I could write a book of my need to's and should have's. Oh well. I'd just enjoy the Crocuses. Lucky you, I think my crocuses have bloomed under the snow. I've wondered if they will do that :D Once the weather finally warms up then I'll start going "hurry, hurry your late for your garden"
Your crocus are blooming before mine. There is something wrong with that picture. I think it is the sunshine that is missing in my picture. The buds are there. They are waiting for sun to make them pop open. I can't wait to see them open. I have been outside picking up sticks. That is about all I have accomplished so far. Can we ever get all those "winter" projects done before spring arrives. It is the only thing that ever makes spring seem like it has arrived a bit early. Sounds like you are a busy girl. Dear Carol, Oh dear, such long lists you have.....best not to make them I always feel. How wonderful to see the first crocuses, they are such harbingers of spring. It's funny how spring pounces - we've spent the winter wishing for things to do in the garden, then it overwhelms us with the to do's. No crocuses yet in Connecticut - yours are so sweet. I have the hubby to do the worrying and the planning for me. I just look forward to the longer days and a few degrees more of warmth. I like being told what to do, when and how, I have enough real problems in my life without letting more creep in. Oh I love crocus flowers - when I look at them I don't think about anything other than 'wow, that's bloomin goregous!'. Take it easy, relax or you'll miss the point. Carol I am on to the 'Gotta dos." This is so apt. We had a mild winter day yesterday and I went outside to prune. Immediately I was overcome with a horrendous case of the "I Need Tos and Should Haves". So much to do. So much, so much. I'm inside today making lists, including "exercise more". Thanks for understanding this affliction in this post! Panic! It hit me yesterday. All the tasks I planned for the winter are not completed. Make a list, wash the curtains, organize the garden spread sheet, finish reading the new books, paint the pantry shelves. It's raining and snowing today. I've got to get a move on! Although I really enjoy reading your posts, this time I relished the photos of the crocus (Don't get me wrong...I still like your narrative). This is one of the flowers I miss the most since relocating to SE Florida. 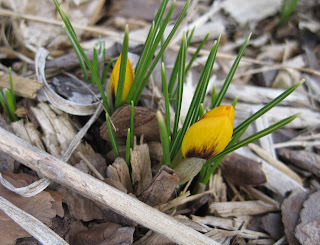 The crocus is such a lovely sign of hope, warm weather, flowers, etc. Thank you so much for sharing! They are the perkiest flowers and even one little tiny bud can lift the heaviest spirits! I have one or two and when the sun returns to the middle south I hope to have a few more~gail ps Dr H is your champion! Oh you lucky thing! Still too much snow cover here in Columbus for anything to bloom, darn it. Normally we don't have this much snow, so I bet mine would be up by now. Hurry spring! Ah I love crocuses. Yours are beautiful. I think part of gardening is always thinking that there is more that needs to be done, but our plants seem to thrive just the same. Oh ys, Carol. I too suffer from mild panic over what should be such a pleasurable time - so much to do, so much weather stopping me doing it. But somehow I always manage to make the time to stop and admire the crocuses.